Equine warts or papillomatosis is the most common equine tumor. It is caused by the papillomavirus. The clinical presentation can be categorized by three syndromes; mucocutaneous (lips), haired skin, or ears. 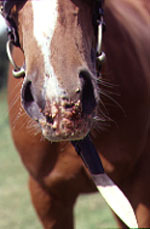 Infection occurs when the virus is introduced into the horse thru open skin. Biting insects can also carry the virus. 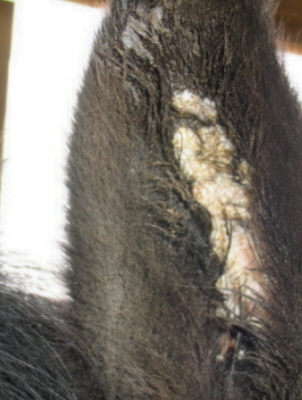 Warts on haired skin such as the muzzle usually affect young horses between one to three years of age. Lesion can vary from a solitary lesion to several hundred lesions. Five millimeter to twenty millimeter growths form on the face, muzzle, and lips. With presentation in the ear the horse develops large white plaques inside the ear. This presentation can affect a horse of any age. Some horses with white plaques are very sensitive and will not let people touch their ears. Flies can be attracted to the ears. These flies will cause bleeding inside the ear when they bite. Secondary bacterial or fungal infection is common. In a healthy horse the skin syndrome and mucocutaneous syndrome is self limiting and will resolve in one to nine months. Many treatments have been tried over the years. The warts can simply be surgically removed. This treatment is usually more of an attempt to improve cosmetic appearance for a horse in show competition. Immunostimulants, topical ointments, and autoimmunization have all been used as treatment for warts. (See the author's blog in this website for another take on treatment) No studies support any of these treatments as the disease is self limiting so it is impossible to know if the treatment helped or if the tumors simply regressed on their own. The ear syndrome that causes white plaques inside the ears is not self limiting and is not treatable. Once a horse develops the plaques it becomes a permanent cosmetic blemish. If your horse has these plaques fly control is very important. A fly mask that covers the ears is very effective. Insecticides can also help control flies. Secondary bacterial and fungal infections should be treated as needed. To avoid transmission of the virus horses that have warts should not be housed with, share tack with, or share feed and water sources with uninfected horses. Control of biting insects is imperative to stop the spread of the virus. Note; equine papillomavirus cannot be spread to humans.